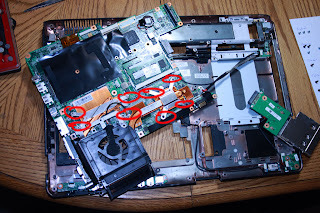 This is the Forth and final Part of How To Disassemble the HP DV9000 series Notebook's / Laptop's Disassembly Tear-Down with photos. By now you have removed all of the bottom screws the keyaboard, Quick Launch bezel, LCD panel, and the top assembly with the touch pad. 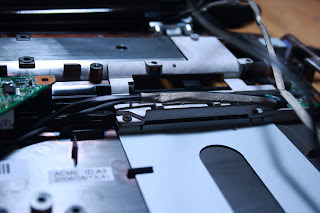 first thinsg first .. there are 4 screws in the pcmcia express card slot that need to be removed.. then the card cage and board will just slide out of the connector. 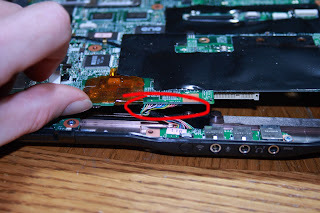 There is no need to entirely remove it from the chassis .. but if you want to just disconnect the cable. I don't usualy take this out because sometimes I forget to put it back in and have to tear it all apart again to put it back. next up is the extention board for the CD/DVD-RW board .. only one screw holding this .. Slide it out and off to the side.. you may have to twist a little there is a standoff in the way. 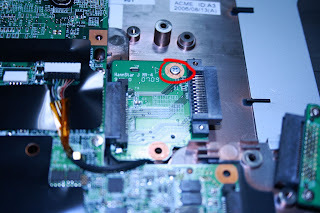 Remove the screws for the speaker assembly and remove it .. if you did not disconect the cable to the powerbutton board do it now. 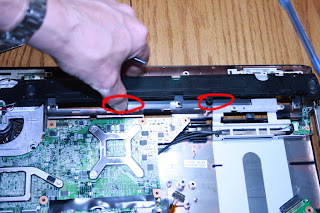 remove this screw holding the fan assembly to the bottom chassis. 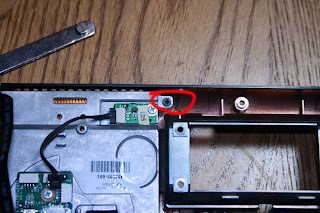 There is one more screw holding the fan assembly to the bottom case. 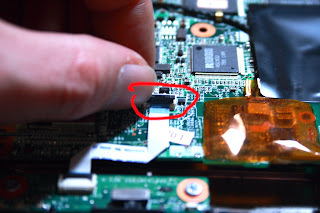 Gently remove the ribbon cable going to the WI-FI switch ... this controls WI-FI and bluetooth (if you have it) there is no need to remove this board .. the systemboard will clear it. De-route the power cables from their keepers. 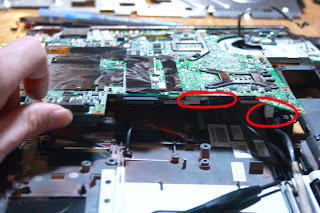 Lift up on the right side of the systemboard.. you can see where the power cables are connected .. don't try to remove them now just be careful handeling the board with them attached .. its easier to remove them later. 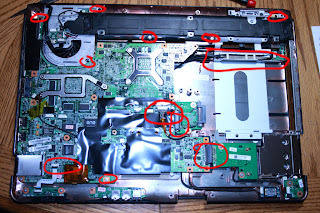 Here is my map of all the screws that were removed... makes things just a little bit easier to put back togather. Congradulations.. to put it back togather just follow this post in reverse order and you should be back to normal. Nothing is removing that trckpad bezel. "Run a credit card around it" is simply hilarious to consider. My card is going before that. It's taken the whole strength of my back to remove some of those keepers and most have just exploded rather than unhook. Eventually getting to the front most one (where the screen release button is), nothing will unlatch it. If I pull any harder I'm going to snap the whole thing in half. Does the button come with it? 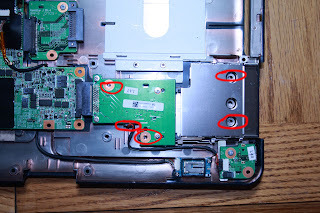 It's just baffling, why bother with screws when you have bits of hell forged plastic? 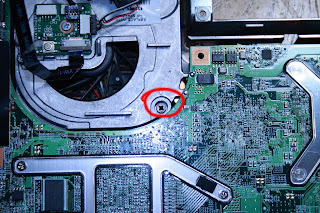 So fustrated right now, and not to mention in a fair amount of pain from stabbing myself on broken plastic and trying to remove unholy little connectors. Otherwise, nice tutorial, the display adapter bit helped alot, it was covered in stickers and black stickiness I sincerely had no idea which way to pull it. Thank you so much- All is almost working... It is powering up, the motherboard id responding, the harddrives are booting... the keyboard is not responding... 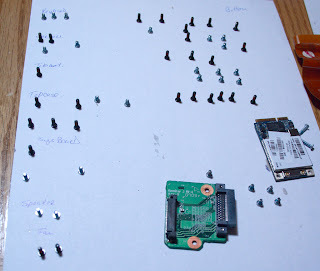 So i will again follow your awesome instructions to remove the keyboard again, check the ribbon & reverse your instructions to put it back together. Again.